Hello. 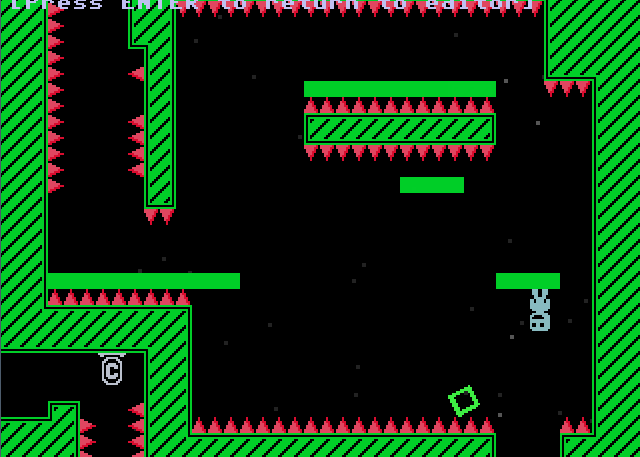 Here's a new level I've been working on for the past week or so. It is pretty large or 9x10 screens, and I think it came out pretty good. It could use a little bit more polish to prettify it a little more, but I'm actually kind of sick of this level and don't want to work on it for at least a few days. So I'm releasing it now. It should all work but if you see any bugs, let me know! Otherwise, enjoy. 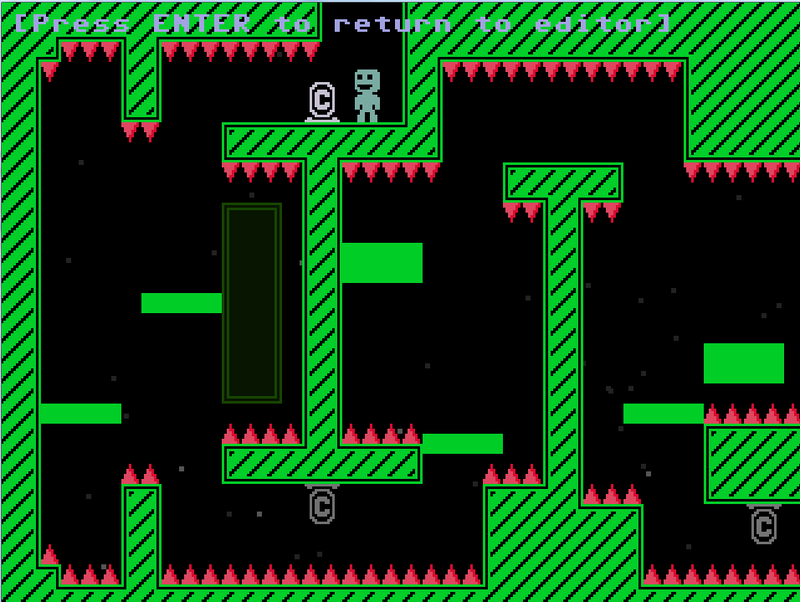 This level seems to have some neat mechanics. I'm stuck though, in a yellow area with gravlines labeled "3" and "7. I touched a checkpoint and there's no way back, but I can't get out of this area. 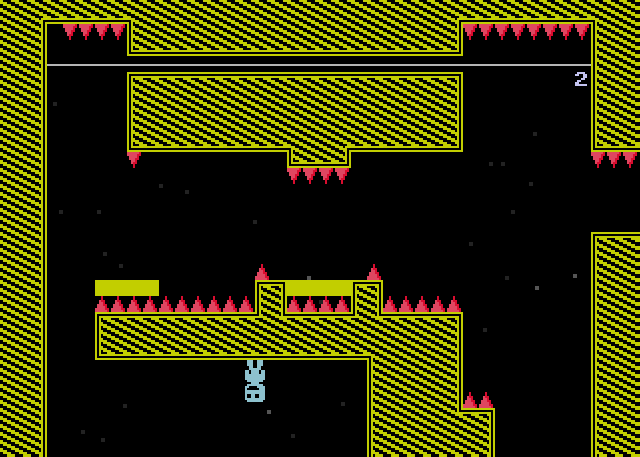 I presumed I had to hit the lines in order of number, but I never touched "2" before and now spikes prevent me from escaping. The number just denotes how many times you can touch it before it disappears. So you have to touch the "7" line 7 times, then it will disappear and take the bigger line next to it away as well, unlocking the next area. This is also the key to collecting the trinket in that area. Maybe it could be a bit more intuitive. I think in the next version I'll add dialogue boxes to explicitly explain this. The counters are all reset if you touch a checkpoint or die, so you have to do it 7 times without dying, too. It looks nice, but on that first screenshot, I don't quite see how you're supposed to get on the bottom. Does one of those platforms move down so you can flip onto it? Yes, some of those platforms are moving platforms. It should become more clear when actually playing. And actually, Viridian is standing at the end of the room, you come in from the other side. Oh. That's hilarious. And I don't know why. I beat the yellow sector and green sector and fully explored the eastern area (except the far "6 trinket" part), but I still don't have the red key. How do I access the red area? Ah, sorry, I totally forgot about the right side of the green sector. I tried the spike/gravline puzzle and it was so hard I figured it was a trinket challenge, not a regular area. I'll have to go back there! This is very well designed. Unfortunately, I have a short temper and the got fed up with trying to get rid of the lines and continuous dying. It's pretty good, I just think that you should add a few more room names, and in the Victoria script, one of the text boxes is a line short. Just thought I'd let you know. I wish it was easier, though. There's some incredibly inventive stuff here (just finished the green/left area too), but this is WAY too hard for most people. I haven't gotten through the Cyan gravity line section yet, but I'll come back to it. Very inventive but Terry is right. I never got past the yellow area due to difficulty. 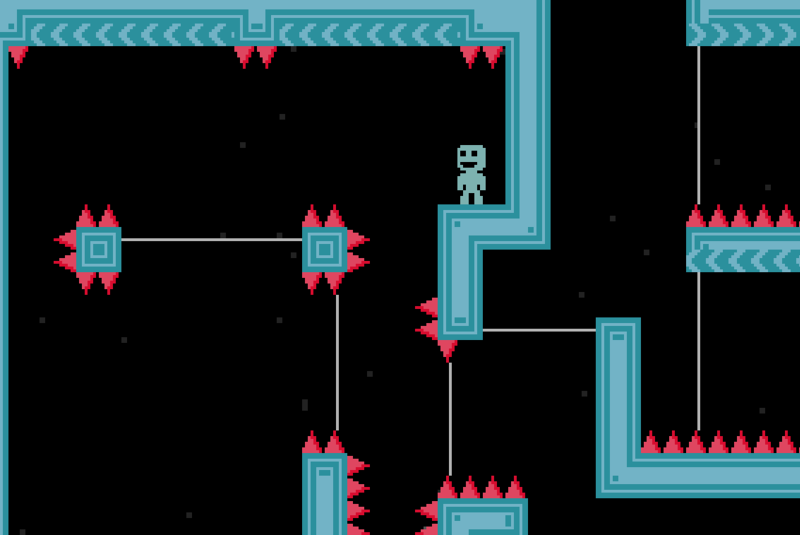 The thing that makes VVVVVV more awesome (to me, remember its my opinion) is how death is such a small penalty. While your gravity lines that need to be hit x times are great, it makes dying sting a little too hard for my taste. Many of the falls are too long to reach them. It would have been nice to see some small puzzles instead of long reflex challenges. I did not make it to the green area so you may have done just that. If so, I apologize. That being said. It felt creative and definitely stood out from other maps. I hope to see another one from you, or at least a little more polish on this. That was tough, but I completed it with all of the trinkets!